springs and comfort of memory foam. This year, use your tax refund to upgrade your bedroom, whether that's replacing your creeks-with-every-movement mattress or upgrading your I've-had-these-longer-than-I-can-remember pillows. Through our One-Earth program, we plant 1 tree for every mattress sold. In honor of Earth Day on April 22, we're increasing our commitment—we'll plant 10 trees for every purchase in April. At Leesa, we know your bedroom is the heart of your home. 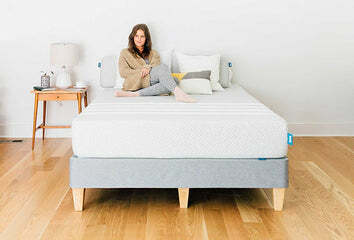 Try and buy the Leesa and Leesa Hybrid mattresses at more than 100 West Elm stores and transform your bedroom into a sanctuary. Leesa is honored to be recognized as a 2019 Real Leader. The Real Leaders 100 acknowledges the top purpose-driven companies in North America that are leveraging business for good and profit.